Not all aluminum windows are the same. An interlock is a secondary system designed to supplement both the locking system and the weather stripping system. If you look closely at this unedited picture of our lock rail and meeting rail profiles, the interlock is indicated by the arrow at the bottom of the union of these two parts. As our sash is lowered and is seated in position to lock, the interlock works with the two rows of weather stripping above it to fight air and dust infiltration and is a very effective barrier to tampering with screwdrivers and knives commonly used to jiggle the lock and force entry. The stout zinc keeperless hardware locking system shown is a standard feature of our operating windows, and it has passed seven different tests by a third-party testing lab against forced entry. 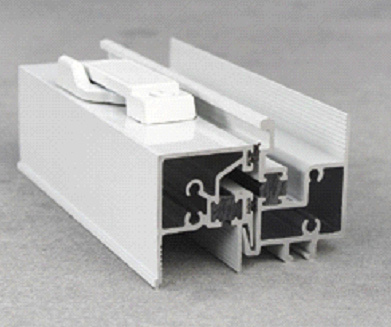 The exposed wall thickness of our metal extrusions is significant, about 20% more metal mass than typical “builder-grade” aluminum windows without thermal break designs. This unedited photograph also reveals the aligned wide thermal breaks, our hollow extrusion chambers, our double weather stripping, and multiple bedding serrations along the glazing channel.